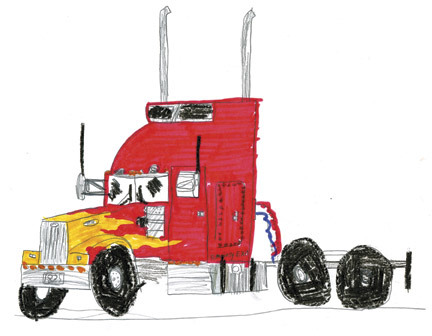 NATHAN'S FLAME-EMBOLDENED PETE: I told you he could draw. Something happened earlier this week and it made my day. Life rather. I'm currently in the middle of researching a story for a business magazine I used to be editor of, Today's Trucking. I sometimes refer to Today's Trucking as my "alma pater". Get it? Pater? Mater means mom. Pater's dad. At Today's Trucking I got to write about all kinds of things I first learned growing up around my late father Tom's bus business, like engine retarders, which are real things. But never mind that. The story I was preparing this week had me calling provincial government offices all across Canada. Here's how I roll. I go online and find main government phone numbers. Whoever answers gets the following--my name, what I'm doing, an abbreviated account of my whole life history, my assignment details, and my last line "who do you think I should talk to?" --and it's all condensed into about five seconds. Over the years, I've found this highly non-strategic system effective with public servants at every level in this country approximately 100 percent of the time. You call a government as a reporter and somebody gets back to you. Woman who answered the phone got my five-second earful and then told me she'd find somebody who could help and, just before going bye-bye, she asked me to repeat the name of the magazine. Her: "And you said your name's Peter?" Her: "This might sound weird but I'm pretty sure it was a Peter from Today's Trucking did something incredible for my young nephew a few years ago." Me: "Are you Nathan's aunt?" One of us, maybe both: "HURRAY!" Her: "You are a hero in that family. I can't wait to let them know this happened." Me (mostly): "Four or so years ago....blah blah blah.. Nathan this...Nathan that.. Great coincidence...coolest story ever...and on and on....and sweet kid....isn't it amazing how much you can love your nephews and nieces?.....I still have the truck picture he drew.. say hi for me.."
I hung up the phone and was like, "Yessssss!" I wasn't no hero. I'd just made a couple of phone calls. Four years ago, when I was editing the magazine, I received a snail-mail letter from an eight-year-old Duncan, B.C., chap named Nathan. 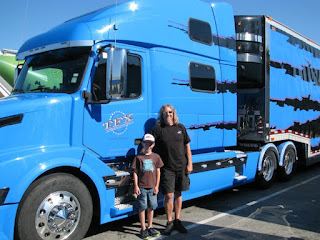 He really liked Peterbilt trucks (who doesn't? ); he was a highly skilled artist (proven by the drawing you see above); and there were one or two other things on his mind. The envelope contained a return address so I Googled it and phoned. That call led to another and after a few weeks of laughing and talking and backing and forthing with Nathan, his mom and some generous folks in the trucking industry, my new buddy and his family wound up going for their very first big-rig ride from Vancouver to the aptly named Hope. B.C. Just connecting with Nathan's aunt (his mom's sister) this week made me relive the whole happy episode and the part I got to play in it. You can get a play-by-play of the original story if you hit the links below. But even if you don't read more, don't forget the important lessons we get out of all this. First is, journalism can make important things happen. Second, you might think Canada's a huge country but in fact it's tiny. You are two and a half clicks away from just about anybody.